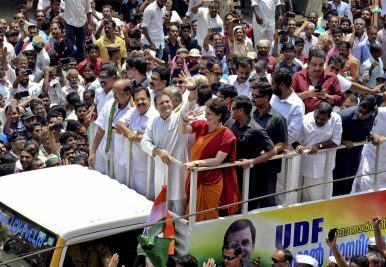 Congress party president Rahul Gandhi, center left, accompanied by his sister Priyanka Wadra, center, waves to supporters as he returns after filing his nomination for election from the Wayanad Lok Sabha constituency in Kalpeta, Kerala, Thursday, April 4, 2019. Rahul Gandhi in Wayanad and Amethi: What’s There to Lose? What is the meaning of Rahul Gandhi’s last minute move? Indian National Congress (INC) President Rahul Gandhi’s announcement to contest in the 2019 Lok Sabha elections from Kerala’s Wayanad district in addition to his Amethi stronghold has surprised many and raised important questions about the strategic impulses behind the move. Located in the Northern regions of Kerala, the Wayanad district is geographically significant as it is the only district to share borders with both the states of Karnataka and Tamil Nadu. The Wayanad Lok Sabha constituency was carved out in 2008 and has seven assembly segments, three from the Wayanad district, three from the Mallapuram district and one from the Kozhikode district. In both the 2009 elections and the 2014 elections the Congress Party and its representative MI Shanavas has emerged victorious. Following Shanavas’ death in November 2018, the seat has remained vacant. The Wayanad district also forms part of the agrarian belt in Kerala with only 3.86 percent living in urban areas. Politically, the Congress party with the Indian Union Muslim League (IUML) as its ally has dominated the constituency although Communist Party of India (CPI) has registered significant support, registering a 38.92 percent vote share in comparison to Shavanas’s 41.2 percent in 2014. The Bharatiya Janata Party (BJP) though has had little success in the constituency, only managing a paltry 8.82 percent. South India holds immense significance to the Congress Party in the 2019 elections. The BJP has never had a significant political presence in Andhra Pradesh (and Telangana), Tamil Nadu and Kerala, with Karnataka the only southern state to have had the BJP in power. While the Congress itself is relegated to the role of a bit-part political ally in both Tamil Nadu and Andhra Pradesh, Karnataka and Kerala remain important states in its bid to increase its seats in the Lok Sabha. Equally important is that the states of Tamil Nadu, Andhra Pradesh, Kerala and Telangana remain resistant to the Saffron wave. By choosing to contest in the South, in Kerala, in a constituency that borders Tamil Nadu and Karnataka, Rahul Gandhi will hope to help create a surge in the Congress’s hopes in the South, partially by conveying the importance the party places on the South. The state of Kerala, in particular, will play a crucial role in determining the fortunes of the Congress party in 2019. The state is one of only a few truly winnable states for the Congress, which formed the state government with its United Democratic Front (UDF) in 2011, only to lose it to the Left Democratic Front (LDF) in 2016. Recent controversies such as the Sabarimala issue as well as violence between vigilantes representing the Left and the BJP in areas like Kannur have positioned the Congress in a positive position while weakening the Left significantly. While Pinarayi Vijayan’s LDF government will point toward its much lauded management of the devastating 2018 floods, the Congress fancies its chances in Kerala. By positioning himself in the constituency of Wayanad, Rahul Gandhi will hope to convey to the people of Kerala the special position of the state to the Congress party. What is the INC’s Strategy? Political commentators have noted that the South has historically been an insurance ticket for the Congress – often used as a last resort when election campaigns fail in the rest of India. However, for the 2019 Lok Sabha elections, Rahul Gandhi’s decision to contest from the Wayanad district of Kerala has a different feel to it given the explosive Hindutva politics it is striving to challenge. The BJP’s unabashed Hindutva posturing has provided ample political material for the Congress to work with, allowing the Congress to cast the BJP in a communal and anti-secular light. The BJP and Narendra Modi have branded Gandhi’s move as cowardly, alleging that he is contesting in Wayanad because he is scared of Hindus after lamenting on Hindu terror, thus implying that Hindus are in a minority in the district. However, according to the 2011 census, Hindus formed a plurality of the population in Wayanad with 49.5 percent; Muslims made up 28.6 percent, and Christians 21.3 percent. The strategic advantage of Gandhi’s move is exactly this: As the Congress party is branded as a secular political party, it makes electoral sense to contest in a religiously diverse constituency which has supported the Congress since 2009. This move is a seemingly opposite strategy to Gandhi’s bastion in Amethi – which has a higher proportion of Hindus in the heart of Uttar Pradesh and the BJP’s fortress. But in strategic terms, contesting from two very different constituencies will bolster Rahul Gandhi’s chances of winning a parliamentary seat if he has ambitions of becoming prime minister. Moreover, given the results of the past two Lok Sabha elections in Kerala, Congress seems to be the party of choice after the Communist Party of India (CPI). Given Kerala’s affinity to communist and socialist ideologies, if sections of the electorate are for any reason looking to change their political allegiance, the Congress is a much more viable and familiar option than the BJP, for example. The BJP’s militant Hindutva policies and slogans and cow vigilante activities are unlikely to gain resonance amongst the diverse and educated population in Kerala. The recent Sabarimala issue is also a major bone of contention between all political parties contesting in Kerala as they all scrambled to define the meanings of secularism, religiosity, and feminism in the state. Rahul Gandhi’s contestation in Wayanad makes the Congress’s case in Kerala even stronger as he is fighting alongside fellow party-member Shashi Tharoor, perhaps the Congress’s most popular politician who is contesting from Thiruvananthapuram – a constituency he has held since 2009. If Gandhi wins from either constituency (or indeed both), it will indicate to the Congress party what the leanings and demographic make-up of its support bases are. They can then posture their future policies accordingly. Pravin Prakash is an Associate Research Fellow with the Centre of Excellence for National Security (CENS) at the S. Rajaratnam School of International Studies (RSIS), Singapore. Juhi Ahuja is an independent political analyst. She was formerly a Senior Analyst at the Centre of Excellence for National Security (CENS) at the S. Rajaratnam School of International Studies (RSIS), Singapore. It is imperative for the INC to take a dispassionate and introspective look at the formidable political legacy of Indira Gandhi.